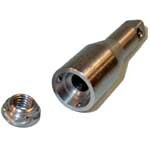 The Stainless Steel Scroll Nut is a high security 2-way security nut installed or removed with a matching Driver Tool. With applications ranging from securing small access hatches in equipment, to fixing massive electricity pylons in place these versatile security nuts are in widespread use throughout the UK and overseas. The cleverly designed high security Scroll-Nut, is virtually impossible to remove without the unique matching Security Driver Tool. The rounded design of Scroll Nuts means that there are no sharp angles to provide a grip for normal hand tools. 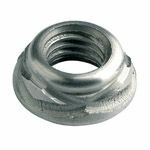 The Scrollnut is manufactured from Stainless Steel, so is ideal for safety or security projects whether they be indoor or outdoor applications. Current applications range from securing street signs, to use securing motor engines to their mountings, but these versatile nuts are suitable for almost any type of security or safety fixing application. The multipoint drive mechanism of the Matching Scroll Nut Security Driver Tool makes these security nuts suitable for medium to high torque applications. And because Scroll Nuts are "Two-way" nuts, you'll be able to release the item secured with the nuts at some future date should you need to (you will of course need to use the special matching Driver Tool to undo the nuts).